carsil (silymarin) 90 tabs carsil (silymarin) is a product liver cleansing. Carsil is a product of plant origin with hepatoprotective and antioxidative action. 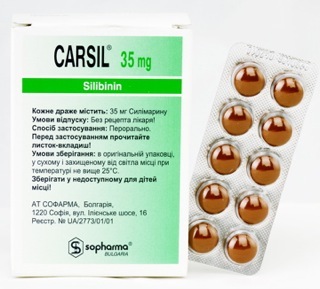 The active component of Carsil is Silymarin derived from Silibum Marianum (Milk Thistle, Bulgarian White Thorn). Silymarin, as the plant active ingredient of Carsil, has a consolidating effect on the cell membrane, thus protecting the liver from harmful impacts and facilitating the recovery of the impaired liver cells. The above is manifested by an improved overall condition, reduced complaints in relation to digestion, and it leads to an improved appetite and weight gain, with subsequent improvement and normalization of the liver parameters in patients with lower blood absorption due to a liver disease. As a prophylactic in increased application of substances that burden the functions of the liver: medicines, alcohol, toxic industrial substances. In severe forms of illness 2-3 tablets three times daily.